Students in first through twelfth grades from a 24-county region in Eastern Montana submitted their presentations, in hopes of receiving one of the many coveted awards including scholarships, plaques, and cash prizes. In the first grade division, Hattie Thompson of Arrowhead Elementary took first place, followed by Josie Lusin of Broadview Elementary in second. Lilly Pueringer of Biddle School took third for her age group, as well as Best Biomedical and Best Physics Project Grades 1-3. Other first grade winners in the grades 1-3 age group included Grady Ray Rumph of Biddle School with Best Animal Sciences Project, Mia Duffy of McKinley Elementary with Best Wildlife Sciences Project, and Angus Strackbein of Biddle School with the Future Scientist award. Jackson Veis of Elysian Elementary was recognized as Judges’ Choice Grade 1. In the second grade division, Hannah Krise of Krise Academy took first, followed by Maryn Hobby of Arrowhead Elementary who received second place as well as Grade 2 Judges’ Choice, followed by Anna Lusin of Broadview Elementary in third. Second grade winners in the grade 1-3 age group included Robert Thom of Huntley Project Elementary with Best Chemistry Project and Lukas Rost of Lincoln Elementary in Baker with Best Physics Project. Owen Rienstra of Rienstra Home School was recognized with the NASA EARTH System Science Award. In the third grade division, Jameson O’Shea of Luther School, Reese Enderson of Meadowlark Elementary, and Reilly Gahagan of Lazy H Academy took first, second, and third, respectively. Haley Alexander of Luther School received Judges’ Choice Grade 3. Third grade winners in the grade 1-3 age group included Berns Barker of Luther School with Best Earth or Environmental Sciences Project and Artistic Merit, Amelia Smith of Grace Montessori Academy with Best Engineering Design, Addison Wells of Lockwood Intermediate with Creativity, and Royal Morledge of Alkali Creek Elementary with Craftsmanship. In the fourth grade division, top five winners included McKenna Engebretson of Central Heights Elementary, Zach Thompson of Arrowhead Elementary, Averi Walkowiak of Luther School, Emory Larson of Central Heights Elementary, and Justin Kruger of Arrowhead Elementary, respectively. Judges’ Choice Grade 4 was awarded to Rylee Harper-Willis of Belfry Elementary. Annalee Krise of Krise Academy received Best Project Involving Food Grades 1-8, and Sophie Douglas of McKinley Elementary received the Interpretation of Theme Award Grades 1-12. In the grades 4-6 age group, Nicholas Kechanin of Central Heights Elementary won Best Physics Project, Elishka Lanning of Home School won Best Chemistry Project, and Sadie Rongstad of Central Heights Elementary won Best Behavioral Health Project. Fourth grade winners in the 1-5 age group included Gwendaline Willems of McKinley Elementary with Most Unusual or Thought Provoking Project, Naomi Moyer of Huntley Project Elementary with Best Geological or Ecological Project, and Gabriel Rasch of McKinley Elementary with The Mack Award. In the fifth grade division, Danica Gamble of Gamble Home School received first place as well as Best Earth or Environmental Sciences Project Grades 4-6. Second through fifth place winners were Ella Cooney of Hillcrest School in Harlowton, Emily Loveless of Home School, Gracie Norman of Huntley Project Elementary, and Sofia Riley of Central Heights Elementary, respectively. Judges’ choice Grade 5 was awarded to Elly Hudak of McKinley Elementary School. 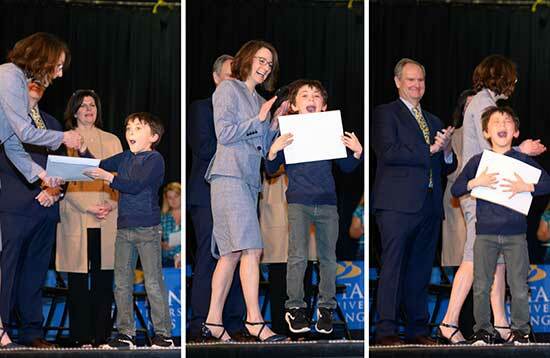 The Materials Science Award Grades 1-12 was awarded to Cadence Cameron of Hillcrest School in Harlowton, and the Best Plant Science Project Grades 1-6 was awarded to Zachary Kechanin of Central Heights Elementary. Fifth grade winners in the grades 4-6 age group included Reagan Heath of Sandstone Elementary with Best Biomedical Project, Shaylagh Cyphers of Central Heights Elementary with Future Scientist, Mary Fuller of Central Heights Elementary with Creativity, and Storie Goldy of McKinley Elementary with Craftsmanship. In the sixth grade division, Cindy Power of Hillcrest School in Harlowton was awarded first place as well as Best Local Ecology Project Grades 6-8. Second and third place awards were given to Max Moore of Luther School and Grady Gahagan of Lazy H Academy. Judges’ Choice Grade 6 was awarded to Noah Eichel of Riverside Middle School. Sixth grade winners in the grades 4-6 age group included Lane DeSaveur of Absarokee Public Schools with Best Wildlife Sciences Project, Aiden Walkowiak of Luther School with Best Animal Sciences Project, and Laramie Pavlovick of Hillcrest School in Harlowton with Artistic Merit. Sixth grade winners in the grades 6-8 age group included Sarah Boetticher of Blue Creek Elementary with Best Alternative Energy Project, and Logan Young of Absarokee Public Schools with the Mack Award. The Research in Psychology Award Grades 1-12 was given to Madeline Lorenzen, and the Taking the Pulse of the Planet Award was given to Alissa Martinez of Absarokee Public Schools. In the seventh grade division, Toby Mark of Greenwood Home School received first place followed by Stran Lytton of Belfry Public Schools in second with Best Use of SI, followed by Hank Jagodzinski of St. Francis Upper School in third with Best Application to Water or Environmental Issues Grades 7-8. Absarokee Public Schools was home to four seventh grade winners including Keagan Sandlin with Judges’ Choice, Shayla Russel with Best Use of Math in a Project, Hayden Steffenson with Best Physics Project Grades 7-8, and Callen Gunderson with Best Earth or Environmental Sciences Project Grades 7-9. In the eighth grade division, first and second place were given to Avery Gates and Nila Dawson, both of Absarokee Public Schools. These two were also awarded Best Biomedical Project Grades 7-8. Sophia Moore of Luther School received third place, as well as Best Electrical Engineering Project Grades 6-8. Judges’ Choice was awarded to Colt Hoines of Absarokee Public Schools and Best Use of Math in a Project was given to Emma Harris of Luther School. Eighth grade winners in the grades 7-8 age group included Angelina Long-Podkonjak of Luther School with Best Chemistry Project, Reatta Wood of Hysham Public Schools with Most Unusual or Thought Provoking Project, Toby Henning of Henning Home School with Best Geological or Ecological Project, Heilka Olson of Luther School with Best Behavioral Health Project, MacKenzie Garen of Belfry Public Schools with Best Animal Sciences Project, Tandy Planichek of Absarokee Public Schools with Future Scientist, Ellanor Lake of Luther School with Creativity, Tara Schrage of Grace Montessori Academy with Craftsmanship, and Andrea Gieser of St. Francis Upper School with Artistic Merit. Monique Mondragon of Absarokee Public Schools was awarded Best Computer Science Project Grades 1-8, and Brynn Barker of Luther School received the Lemelson Early Inventor Prize. In the high school division, Kitrie Frank of Red Lodge received second place followed by Madisynn Weber of Billings Senior in third with the Geoscience Award Grades 1-12 Female, Best Earth or Environmental Sciences Project Grades 10-12, and the Stockholm Junior Water Prize Grades 9-12. Best Use of Math in a Project Grade 9 was given to Claire Hatch of Absarokee, Computer Science/Engineering/Physics/Chemistry Award Grade 11 was given to Mallerie Stromswold of Billings Senior, and Best Naturopathic Project as well as In-Vitro Biology Award Grade 11 was given to Cleo Schied of Billings Senior. Other high school winners from Billings Senior include Natalie Romei with Best Biomedical Project, Jake Gilbertson with Best Energy-Related Project, Rendan Klein with Best Physics Project, Addie Mattson with Best Animal Science Project Involving a Pet, Quinn Sanderson with Innovative Solutions for Planet’s Sustainability, Simmone Clay with Best Chemistry or Biochemistry Project, and Reagan Paris with the Stockholm Junior Water Prize. Allyssa Thormahlen of Belfry received the Mathematics Award as well as Outstanding Work in the Theme of Environmental Sustainability along with Neil Adams of Red Lodge. Dani Rost of Baker received Creativity, while Madison Peete of Billings Senior received Craftsmanship and Artistic Merit. More winners from Billings Senior included Madeline Bach with Excellence in Computer Science, Virginia Montague with Best Local Ecology Project and Sustainable Development Grades 1-12, Parker Kraske with Best Behavioral Health Project, Spencer Reitz with Best Electrical Engineering Project and Best Engineering Design, Michael Morehead with Best Application to Water or Environmental Issues and the Stockholm Junior Water Prize, Ethan Heyneman with the Homestead Royalty Scholarship, and Carly DeBar with Future Scientist.